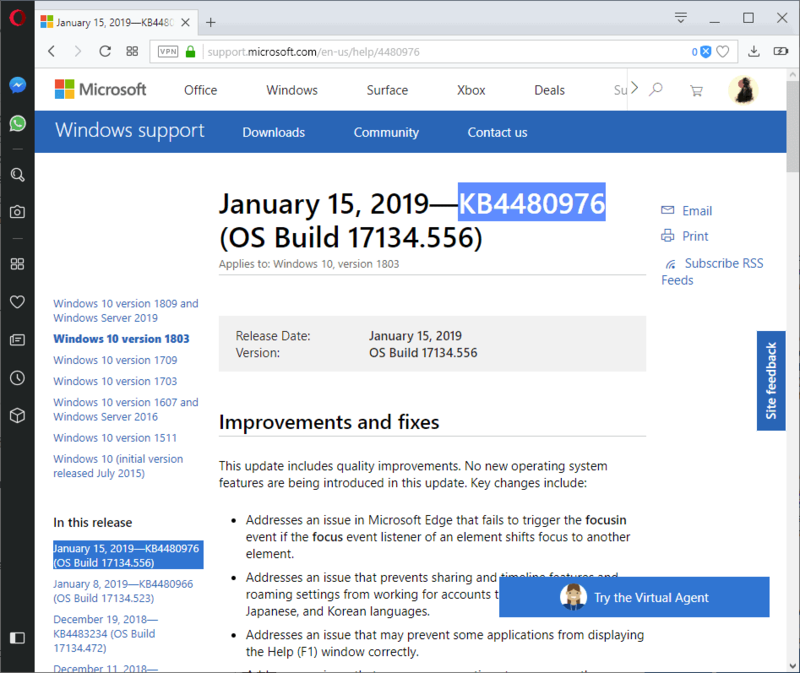 Microsoft released the cumulative updates KB4480977, KB4480959, KB4480967 and KB4480976 for various versions of the company's Windows 10 operating system and Windows Server 2016 in the past couple of days. 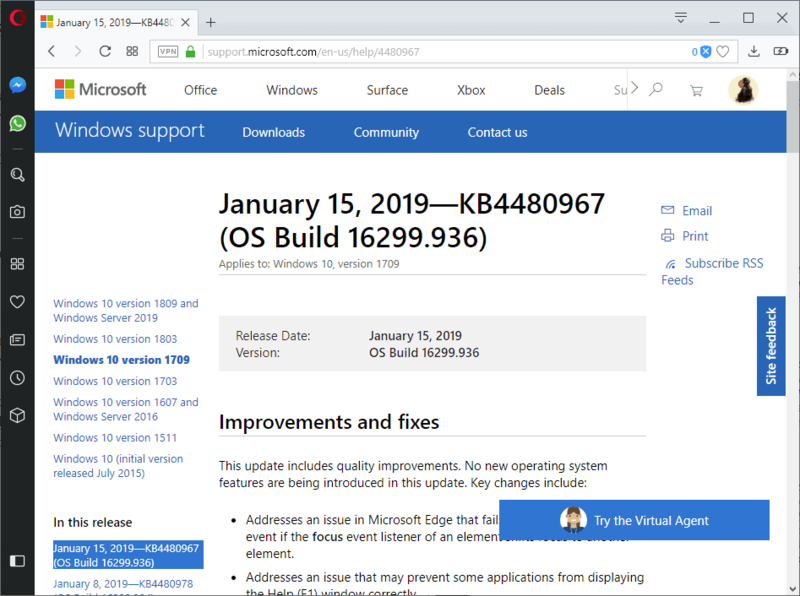 The updates, for Windows 10 version 1607 to 1803, but not Windows 10 version 1809 or Server 2019, address several issues. While they do fix issues, they have known issues as well that users and administrators need to be aware of. 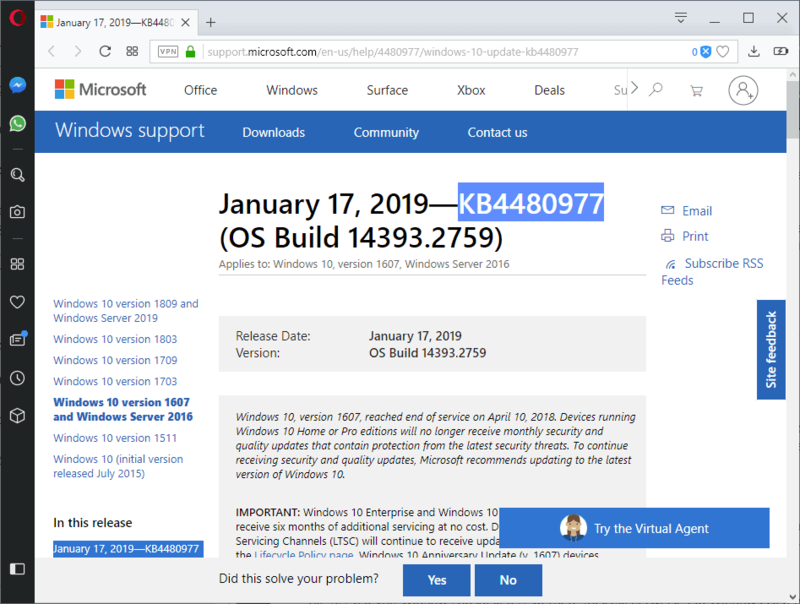 KB4480959 was released on January 15, 2019. It is a cumulative update for Windows 10 version 1703 that increases the version of the OS to 15063.1596. Fixed a hotspot authenticating issue that affected third-party applications. Addressed a file overwriting issue in shared folders when filter drivers were loaded. Fixed a 30-second delay when deleting or renaming links in a Distributed File System (DFS) Namespace. Fixed a issue that caused signed scripts, even those included natively in Windows, to generate Windows Defender Application Control failure audit events. Fixed Bitlocker Network Unlock failing on 2nd generation VMs if the network supports only IPv4. Fixed Help window (F1) display issues. Fixed a focus event issue in Microsoft Edge. Fixed an issue that caused downloads to fail. Fixed an exception issue with SqlConnection. A issue with Microsoft JET databases that use the Microsoft Access 97 file format. Database won't appen if columns exist that have names with 33 or more characters. Check the workarounds posted on the support website. Some users report loading webpages with local IP addresses in Microsoft Edge. A workaround has been published. The update shares most of the fixes and all known issues with KB4480959. Applications may stop working when long Kana is converted to Kanji. Fixed an issue in multi-monitor environments that caused a program window to be moved to a different window when a user reconnected to an existing session. Fixed a wallpaper update issue if configured using the Group Policy Editor. Fixed an issue with scheduled tasks not running if created in disabled state. Fixed issues that could cause bluescreens when connecting Thunderbolt devices. Fixed error 0x139 when connecting to a Remote Network Driver Interface Specification (RNDIS) device. Fixed sharing and timeline features, and roaming settings did not work correctly from accounts that use Chinese, Japanese, or Korean languages. Fixed an issue that caused power options to appear on the Windows security screen when the option to hide them was enabled in the Group Policy. Fixed an issue that caused links for certain "compressed file formats" from resolving. Addressed an privacy issues with applications that could obtain BroadFileSystemAccess without consent. Fixed an application stop working issue with WAM loggin. Fixed an issue that caused Windows Driver Frameworks to cause high CPU usage. Some users may not be able to pin web links to the Start menu or taskbar. The updates share some of the fixes described above. Fixed an issue that caused lockscreen images from not updating under certain circumstances. Fixed a File Explorer stop working issue after several days of uptime. Fixed boot failure issues "that occur when you restart certain hyperconverged infrastructure (HCI) virtual machine". Addresses issues with taking snapshots on hyperconverged Storage Spaces Direct (S2D) cluster nodes. Addresses an issue that prevents volumes from going online as expected when you add back drain nodes during maintenance. Addresses an issue that fails to decrement the dirty region tracking reference count when a storage repair job is running on hyperconverged Storage Spaces Direct (S2D) cluster nodes. Addresses an issue that causes the PowerShell Desired State Configuration (DSC) pull server to return “ResourceNotFound (404)” after the Internet Information Services (IIS) application pool is recycled. Fixed a visibility issue with RemoteApp windows. Infrastructure management issues after VMM refresh for System Center Virtual Machine Manager managed workloads. Workaround is available. Instant Search in Microsoft Outlook clients may fail with "Outlook cannot perform the search". Workaround available. Windows may fail on Lenovo laptops with less than 8 GB of RAM. Workaround available. Taskbar icon issue after changing file association defaults. The update for Windows 10 version 1809 is being tested in the Release Preview ring currently. 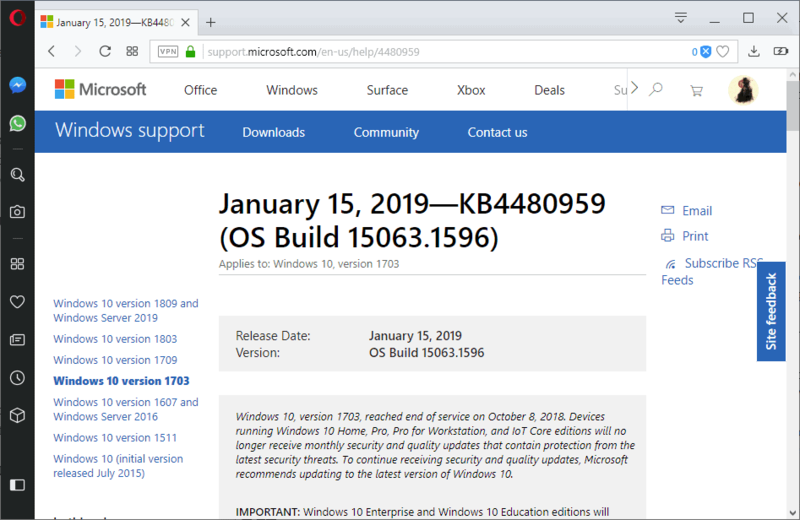 Microsoft released the cumulative updates KB4480977, KB4480959, KB4480967 and KB4480976 for various versions of the company's Windows 10 operating system. Thanks, Martin, For explaining what Microsoft is doing with main paid and bought Microsoft operating system. More and more I am quite sure (Think 18-07) that Microsoft is still in the pre-release face from there much to earlier brought 10 operating system on the market. Just like they did with there o.s. called Windows 8, Windows 8.1. Microsoft always had their problems over the decades with upgrading there operating systems. Image where they could be when they’re not so eager to make a few stockholders happy. I am quite sure those same stockholders would be even happier right now. Like a year I am waiting when the Windows o.s. updates will kick in. Still, on main almost a year old 1803 version the latest build upgrade is 17134.523. No more search for updates for me. It was 6 days ago. Microsoft is pushing and updating automatically home users to 1809 ! Oddly, couldn’t find the option to completely disable all telemetry and personal data collection. Telemetry and Data collection (Spy-ware) always works perfect doesn’t it? It can’t be disabled and never needs updates or patches. It really shows where their development priories are. All your computers are belong to us! OMG! I almost wet myself laffing…..Its so True. Microsoft always had their problems over the decades with upgrading there operating systems. online they can control you better. Now with Windows as a service you dont own your copy of Windows THEY DO. Now…. I dont own my linux OS, but neither does anyone else! And certainly no one who has ill will for me. Most Linuxes are ALOT easier than this. I recommend a 2nd comp,because everyone makes mistakes at first. & seemingly have it all.